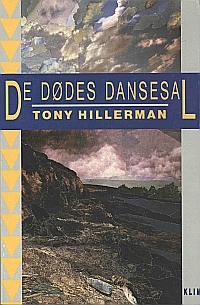 A 1993 paperback edition of Tony Hillerman's 1973 novel Dance Hall of the Dead, published in Danish. The cover art, by Nils-Ole Lund, is a striking torn paper collage that evokes a twilit barren landscape under a storm-filled sky. The text is translated from English by Søren K. Barsøe. Binding: Full color paper cover with attached inside flaps on both the front and back covers. The front flap lists Hillerman titles published by Klim. The back flap displays a black-and-white photograph of the author and a short biography.